It was the day that was supposed to finally prove what Luddites and other tech haters had been saying for so long: computers  not sin or religious prophecy come true  will bring us down. For months before the stroke of midnight on Jan. 1, 2000, analysts speculated that entire computer networks would crash, causing widespread dysfunction for a global population that had become irreversibly dependent on computers to hold, disseminate and analyze its most vital pieces of information. The problem was that many computers had been programmed to record dates using only the last two digits of every year, meaning that the year 2000 would register as the year 1900, totally screwing with the collective computerized mind. But it just wasn't so. 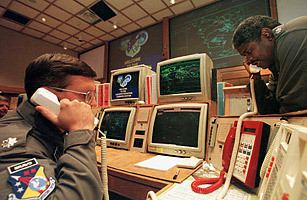 Aside from a few scattered power failures in various countries, problems in data-transmission systems at some of Japan's nuclear plants (which did not affect their safety) and a temporary interruption in receipt of data from the U.S.'s network of intelligence satellites, the new year arrived with nothing more than the expected hangover. See pictures of celebrations welcoming the new millennium.